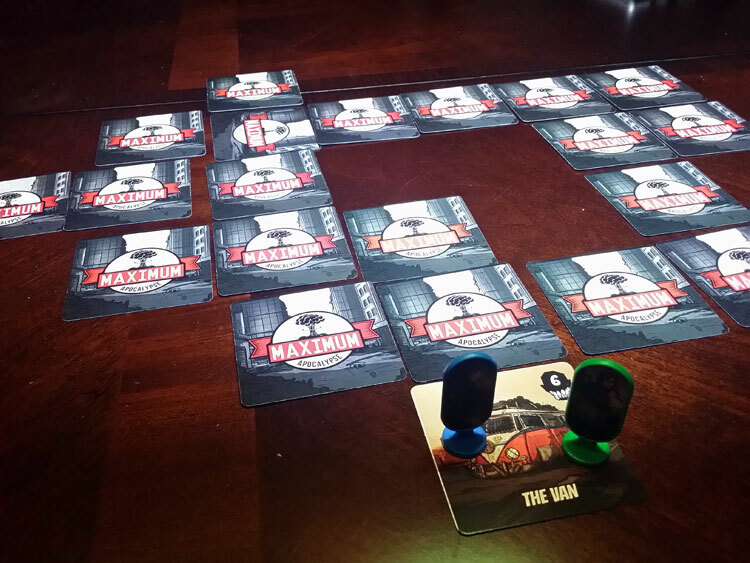 Dungeon crawlers have been a staple in tabletop gaming for decades and recently there has not been any shortage of hack-n-slash adventures for gamers to sink their teeth into. My issue with these types of games is two-fold. First, up until the recent wave of tablet integration over the last few years, there has been the requirement of the overlord player; and second, the fact that for the most part, there is extremely limited replay value. That is, aside from moving the treasure from one room to another, the campaign mission stays pretty much the same playthrough to playthrough. 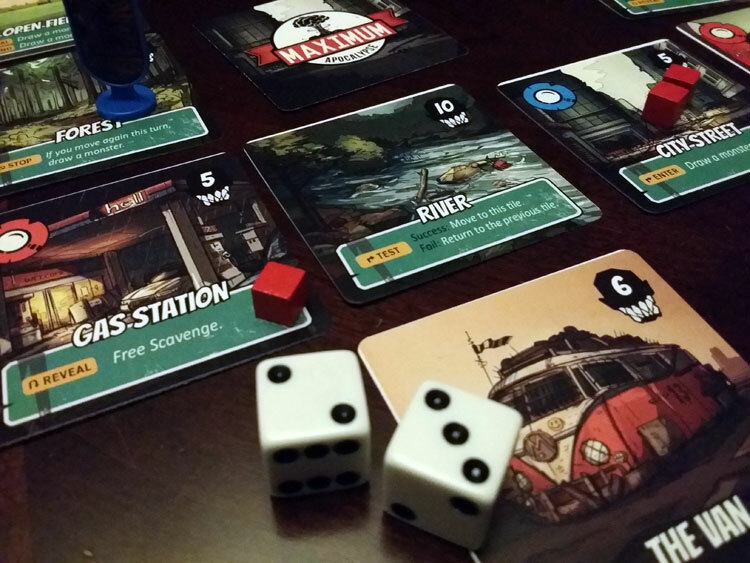 Maximum Apocalypse, now in funding on Kickstarter, attempts to solve this. Designed by Mike Gnade at Rock Manor Games, Maximum Apocalypse is a unique cooperative, mission/campaign based, roguelike adventure card game that plays 2 to 6 players in 45 to 90 minutes. Maximum Apocalypse combines the replay value of classic endless dungeon roguelikes (e.g. Rogue, NetHack) with the best parts of mission directed dungeon crawlers and campaigns (e.g. Imperial Assault, Conan). After randomly generating the map, players choose which survivor role to take on and then determine the post apocalyptic flavor of the day: zombies, aliens or nuclear fallout. Each hellish landscape has a unique set of monsters and missions to overcome and all the while, players are attempting to mitigate limited resources and degrading health. Note: The Alpha Version of the game that I played did not contain a final rules set, all of the monsters, or all of the classes, but the skeleton was there. 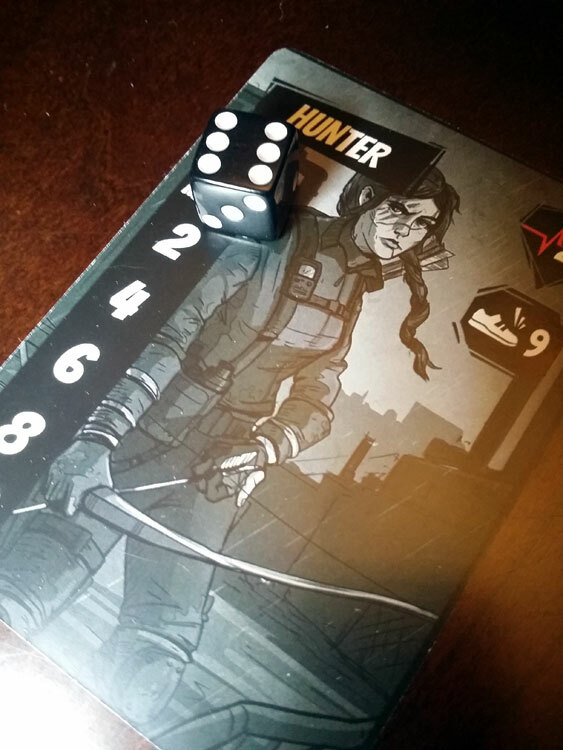 While we don’t usually talk about artwork in previews, I really liked the artwork in my prototype version. Players start by choosing to pit themselves against one of the apocalyptic monster decks (in my case, Zombies) and choose a mission to complete from the mission book. A “dungeon” is then generated by randomly laying location cards face down (e.g. gas station, grocery store, hospital, river, farm, forest) in whatever orientation players want. Players then pick a class to play. The Alpha offered fireman, hunter, surgeon and gunslinger. During gameplay, players trek through the dungeon map revealing and scavenging locations, battling a seemingly endless horde of monsters, and trying to overcome a general lack of resources (food, ammunition, medicine etc.) long enough to complete all of the mission objectives. Most missions require that players locate something or someone in the scavenge decks, defeat the boss monster, and make their way back to the starting tile. Players roll to spawn monsters in the path behind them. The randomness of the map and the variety of the locations adds to the depth of the game. Maximum Apocalypse captures the heart and soul of the roguelike genre while still maintaining the mission cohesiveness of dungeon crawlers on the market today. In the Zombie missions that I played, I was surprised by the variety offered by the enemies and how this was compounded by the randomness of my map. Classes feel distinct and really affect how a mission plays out. Each character has an ability on the class card in addition to a unique draw deck that has abilities relevant to that character’s strengths. For example, the gunslinger is good at (surprise) ranged attacks while the fireman is optimized for close range attacks. The map is randomly generated at the start of each game making replays fresh and suspenseful. 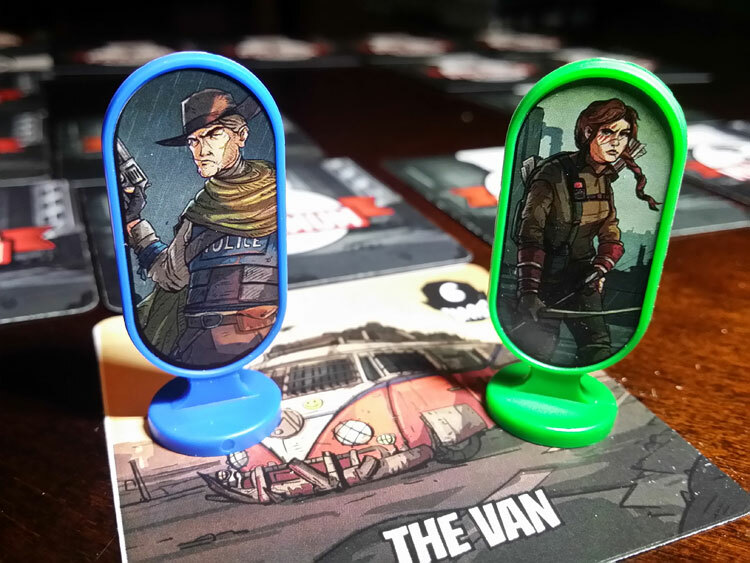 After failing a mission where we had to gather samples and a scientist and then get back to the getaway van, we tried again with new character classes. The difference this made to our experience was noticeable and really demonstrates how much depth there is the box. It was surprising to us how much character selection strategy mattered mission to mission. This was further balanced by the randomness of the board and the drawing and spawning of the monsters. To spawn monsters each turn, players roll dice and place monster cubes on the indicated explored locations (like Pandemic combined with a sort of reverse Catan). Additionally, exploring locations while hunting down those objectives can trigger a monster attack or additional monster spawns. Combat in Maximum Apocalypse is a little like Munchkin (in a good way!) with its “equip this, hit with that” mechanics, which made turns run smoothly, quickly and easily. This also added depth to the character class selection as certain equipment is only available to certain characters in the beginning of the game. The Hunter is one of the few classes in the game. Don’t get the impression that this is a simple kick in the door and kill all the monsters game though, the map setup pretty much guarantees that players will have to split up in some fashion to accomplish the objectives and the rather unique hunger counter means that there might not be enough time. To escape being slowed down for a turn by monsters, there is the option to sneak away. As the monster cubes pile up, this becomes more difficult to accomplish and, as we learned, you need everything you can muster to make it through those late game turns. Maximum Apocalypse is packed to the brim with tough choices and potentially bad decisions. The apocalyptic survivor theme shines throughout the game as well. In addition to the obvious hack and slash and objective requirements of mission based adventure games, players must contend with the stress of starvation as their hunger increases each turn. If a player opts to go 6 straight turns without scavenging for and eating food, irreparable damage starts to happen to the characters. While at first I wasn’t too keen on this mechanic, it won me over when I realized that this helps prevent players from going in and trying to take all the time they want to clear every location and kill every enemy. I found myself weighing the costs versus the benefits of sacrificing actions to scavenge and eat food in the late game against running through my objectives and exploring further locations. Compound this with the mounting hordes surrounding us and you have one exciting game. 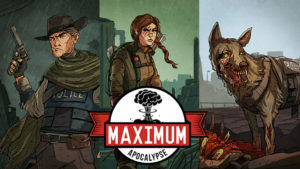 Maximum Apocalypse is an excellent cooperative game that has obvious roots in roguelikes and dungeon crawlers, but combines everything into a fresh package that is fun to play and replay. Let me be absolutely clear – you have not played a game like this before. Gaming groups that may be reluctant to break out completed campaign settings in other games will find the randomized roguelike map and lack of an overlord refreshing. Rules wise, the game is easy to learn and simple to pick up if someone is new to the genre. And, only because it is worth mentioning, we always caveat the art of these previews, but I can attest to the fact that the art in this Alpha was excellent – it didn’t only fit thematically, it looks great. Definitely check this one out. Replay value alone will make sure you get your money’s worth. Maximum Apocalypse is now in funding on Kickstarter. If this sounds like a game you’d be interested in, head over to their campaign page to back and find out more information.